Rice and lentils make such a perfect pair. It’s become my go-to comfort food because it’s easy, nutritious and deeply satisfying. We make it at home all the time, variations of it… not really based on a specific recipe, but using the mejadra recipe from the Jerusalem cookbook as a general guide. When we have the time and desire, we make the fried onions just like in the cookbook, piling it atop the rice and lentils, sweet and caramelized, giving it rich flavourful depth. 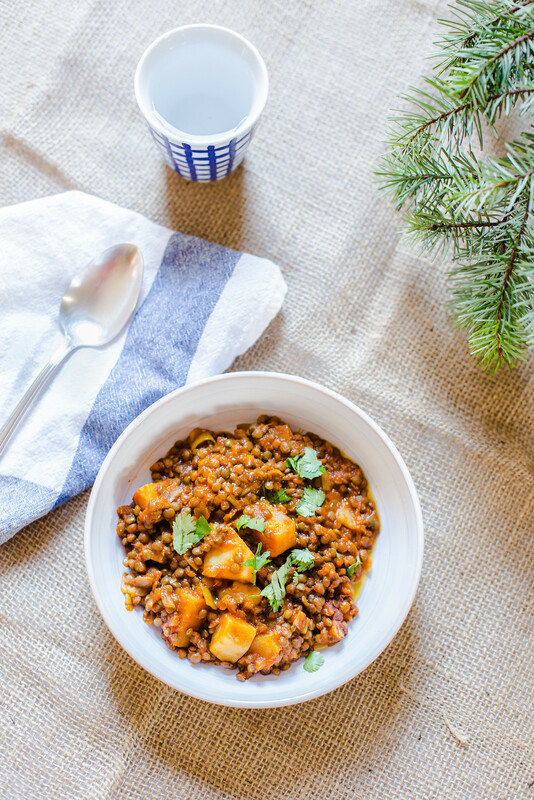 We even make rice and lentils when we aren’t home; we made this quick and dirty version a few months back while on vacation, it’s so fast and simple we’ve incorporated it into our dinner routine for those rushed weeknights. The recipe came together in a rather cosy way though; we’d spent the day exploring the city and decided we wanted to make something quick, nourishing and homely for lunch. We picked the lentils, rice, onions and the other ingredients needed for lunch from the market. We even picked up a lovely bouquet of flowers from the kind fleuriste by our apartment for €5, we just couldn’t resist! In this fast and easy version, the rice and lentils are cooked separately and tossed with sautéed onions in a stir-fry fashion. At home, sometimes we cook the rice and lentils over the weekend, keep them in the fridge for use throughout the week, it’s very convenient. We switch up the seasoning too, we use herbs occasionally; fresh green cilantro, parsley or mint enlivens the dish beautifully. The spices used here are warm and rich, and enhances the deep savoury flavours in the dish. We’ve made this variation of rice and lentils a few times since we’ve been back, and it takes me back every time to that charming little apartment overlooking the rooftops of the Marais. Rice and lentils make a beautiful nutritious pair in this healthy super tasty dish!